Vintage silver colored chrome and enamel collectible souvenir spoon from FLORIDA featuring a 3-dimensional palm tree charm. 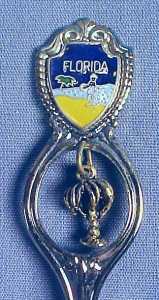 The colorful enamel shield features FLORIDA, a person on the beach playing with a beach ball and the ocean and sand. The palm tree charm is three dimensional and hangs within a opening below the enamel shield. 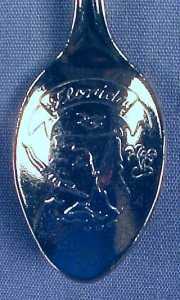 The bowl of the spoon is engraved with an outline of the State of Florida, palm trees, fish and birds. Excellent condition. The Florida Beaches are among the finest in the world. Every year, several Florida beaches routinely receive awards by various rating organizations. In fact, Florida beaches have been rated among the top ten in Dr. Beach's America's Best Beach list each year. This vintage chrome and enamel collectible souvenir spoon from Florida measures nearly 4.5" in length, weighs .4 ounces and is unmarked as to maker.